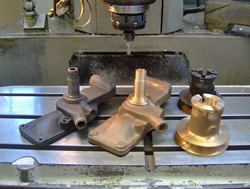 We provide a specialist comprehensive service for the repair of packing-gland and carbon-sealed waterpumps, typically found on pre 1950's cars and commercials; especially those for SS and Jaguar cars. We replace the spindle with a new stainless steel item as originally fitted, re-cut or replace the carbon seal as required and fit new bearings and any other minor parts that may have been damaged or irreparably worn. We now remanufacture brass water pump impellers for both pushrod SS / Jaguar models and early XK engines as well as cast alloy back plates for Mk 5 models which have long been unavailable. Please note that we do not provide a service for modern cartridge-bearing pumps, due to the vast numbers and types of sealing units used, making correct identification extremely difficult and thus not cost-effective for the customer.